Originally published under the title "Wrong Choice for Center for Jewish History." 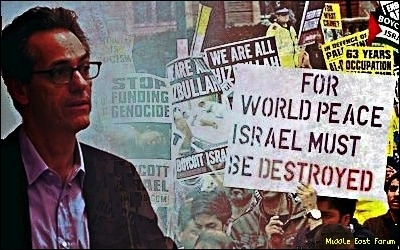 David N. Myers advocates "limited" international boycotts against Israel. When a respected and apolitical institution like the New York-based Center for Jewish History (CJH) hires an anti-Israel academic to be its new CEO and president, something has gone terribly wrong. UCLA Jewish studies professor David N. Myers may present a moderate façade, but his academic and political affiliations expose his radical core. The pro-Israel community has taken notice. Ronn Torossian, Hank Sheinkopf, and George Birnbaum wrote an op-ed calling attention to Myers's "extreme viewpoints" and charging CJH with making an "unfit choice." The Israel Group urged opponents to write in protest. JCCWatch and Americans for a Safe Israel announced plans for an October 18 street protest outside CJH. Predictably, the academy has rallied around Myers. Jewish studies scholars by the hundreds signed a petition supporting him. Jonathan D. Sarna and David Ellenson of Brandeis University lauded Myers as the "very model of an engaged and responsible scholar," even calling him "the embodiment of the center." Speaking to this author, Sarna stressed the need to make distinctions "between enemies and critics of Israel," saying of Myers "There are real enemies, but he's not one of them." Myers may present a moderate façade, but his academic & political affiliations expose his radical core. But if Myers is not an enemy of Israel, one wonders who is. He serves on the board of the New Israel Fund, the advisory council for J Street, and has participated in an If Not Now fundraising drive. Evidence of past association with Jewish Voice for Peace is strangely denied by JVP. As Daniel Greenfield of the Horowitz Center notes, "There is hardly an organization in the anti-Israel network where Myers hasn't left his fingerprints." As for BDS, Myers was open to a "limited boycott" of "Israel's settlements and commercial activity in the West Bank" unless Jerusalem complied with Obama administration diktats. Myers fantasizes that an Israeli withdrawal from the West Bank will resolve the Arab-Israeli conflict (ignoring the calamity of Israel's withdrawals from Lebanon and Gaza). No withdrawal means apartheid: "If Israel is not able to extricate itself from the West Bank," he warned in 2009, it must "maintain a two-tiered system—two regimes of legal status for Jews and Arabs—which in other contexts, went by the name of apartheid." Likewise, Myers accuses Jews of "oppressing other people" and uses the Arabic term nakba (catastrophe) to describe Israel's founding. Myers opposes efforts to combat campus anti-Semitism. Myers opposes efforts to combat campus anti-Semitism. He signed a 2012 petition to the University of California president demanding that he scuttle a UC Advisory Council on Campus Climate, Culture and Inclusion report about the hostile campus climate for Jewish students. In 2015, Myers recommended against the University of California system adopting the State Department's definition of anti-Semitism. He strongly opposes outside organizations, such as AMCHA Initiative and Campus Watch, calling attention to academic anti-Semitism. In 2002, he bizarrely predicted that "The number of voices tinged with hatred of Jews is small . . . compared to the amount of anti-Muslim or anti-Arab sentiment on campus and beyond." In 2010, Myers opposed the Orange County District Attorney filing charges against the Muslim Student Association for disrupting a lecture by the Israeli ambassador, Michael Oren, at UC-Irvine. Myers protested Israel's defensive action in Gaza in 2009, then weakly responded to a UCLA Center for Near Eastern Studies 2009 symposium on this topic widely condemned for its anti-Semitic content. Those in the UCLA community who know him best have the lowest regard for him. A UCLA alumnus recalls: "You have no idea how many kids he has turned off to Israel and how he espoused his anti-Israel rhetoric at any opportunity. Israel is to blame for everything according to him and he's dangerous because of his self-proclaimed 'love' for the Jewish state." A fellow UCLA professor concluded that "The damage that Myers caused to Jewish life at UCLA will take many years to erase. ... Myers simply does not believe that Israel plays, or should play a central role in Jewish identity. This will be reflected in the character of Jewish history that will be filtered under his leadership [at CJH]." Fulfilling CJH's mission to illuminate Jewish "history, culture, and heritage" requires leadership with the vision and courage to support Israel's struggles in spite of academic pieties that, if enacted, could destroy Israel as a Jewish state. David Myers is a Trojan Horse for the furies that seek to do just that.